*This splendid executive five bed villa will not disappoint the discerning holiday maker. Five minutes drive from the Disney area, the villa is built on a large 1/3 acre plot, south facing and is very secluded. Built within a conservation area, this executive home is set in palm-fringed streets, and spectacular lakes making Formosa Gardens Estates the most prestigious community in the Disney area. *Air-conditioned Games Room with Pool Table, Air Hockey, and electronic darts. *Three themed bedrooms � one as a Disney room, one as movie room and one as a sports room. 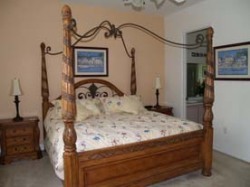 There are two Master bedrooms one with a King-size 4 poster bed and one with a Queen. Both masters have ensuite bathrooms. *Satellite TV with English Premiership football in all bedrooms and lounge. *All bedrooms and the lounge have DVD player. *South facing 30 ft pool with Jacuzzi heated by gas for greater efficiency. *Separate free hot tub in addition to the Jacuzzi.